Do All Photographers Have Girlfriends that Look Like Grace Kelly? When I speak at conventions and workshops I like to tell a funny, folksy story about how I came to be a photographer. Growing up in Fresno, CA away from the big-time sports (except for listening to Russ Hodges and Lon Simmons broadcast Giants' games on radio station KMJ) all we had were movies and television. I remember when I was 13 or 14 watching Alfred Hitchcock's "Rear Window" on TV. 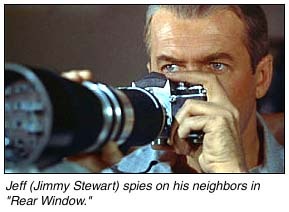 Made in 1954 by Alfred Hitchcock and starring James Stewart, "Rear Window" is the story of a sports photographer who is laid up in a wheelchair after an accident while on assignment. 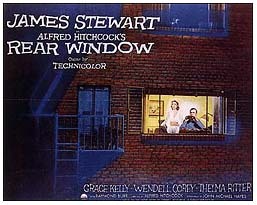 Confined to his apartment, Stewart takes to watching the activities of his courtyard neighbors through a long telephoto lens, including one (played by Raymond Burr) who murders his wife. Now you're thinking: "Makes sense, covers big-time sports. 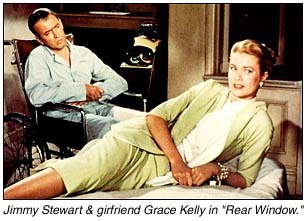 Uses all of the state of the art camera gear "
But what REALLY drew me to photography was Jimmy Stewart's girlfriend in "Rear Window" Grace Kelly! Now I thought : "Hey! All photographers must have girlfriends that look like Grace Kelly!" Having a three-day Memorial Day holiday weekend to spend with the family (well, except for shooting the Lakers-Kings Friday night!) is a treat. But after Emma and Deanna went to sleep, instead of working on the computer or replying to all the e-mail I get, I revisited "Rear Window". I've been in this business a long time (maybe too long it) but it was refreshing to watch an old favorite like "Rear Window". But after popping the tape into the player, I came across some lines in the film that are absolute gems that we can apply to our business even today. JEFF (Jimmy Stewart, in a wheelchair with a broken leg): I get myself half killed for you and you reward me by stealing my assignments. JEFF: You asked for something dramatically different. You got it. JEFF: Gunderson, how did you ever get to be such a big editor with such a small memory? GUNDERSON : By thrift, industry and hard work and, uh, catching the publisher with his secretary. STELLA (Jeff's nurse): We've become a race of Peeping Toms. What people oughta do is get outside their own house and look in for a change. Yes, sir. How's that for a bit of homespun philosophy? While telling people that "Rear Window" is what spurred me on to photography, on this Memorial Day my thoughts go to the real people who got me started in photography. My mom Helen and especially my dad Seico. My earliest memories of my dad is of him composing a "gamer" on a Linotype machine (I kid you not) after covering a Fowler High football game. My dad worked and later owned a small weekly newspaper 10-miles south of Fresno, the Fowler Ensign. That is where I got the newspaper "bug". And where did I get my love for the written word, photography and especially sports? Reading all of those newspapers my dad and mom subscribed to. Talking about our beloved Giants and 49ers. Taking in the occasional Giants' game at Candlestick Park (no corporate naming merry-go-round back in the 60's and early 70's!) and sitting in crappy John Euless Ballpark to watch the local single A team. These are some of the things that got me where I am this day. My dad worked an awful lot while I was a kid but there was always time to talk about a stat I saw in the baseball "Who's Who" or something I read in the sports section of the Fresno Bee. My mom was a big part of this too putting up with taking me to games I wanted to photograph for the Roosevelt High "Roughrider" before I was old enough to drive. She also didn't complain much when I talked all the time about cameras and used all my money to buy some piece of camera equipment ("Robby a flash that doesn't need bulbs? How wonderful!"). So on this Memorial Day I hope you all spent time with the family ... or your girlfriend that looks like Grace Kelly. But most of all I hope you think back to the people who helped you along the way and were patient with you when you said you wanted to become a photographer (or whatever it was you wanted to be at 12 or 13). I certainly did while "Rear Window" was flickering on that screen the other night. For this Memorial Day Holiday we have a special article written by Sports Illustrated's Chuck Solomon recounting the police officers and firemen he met while covering the "Subway Series" and what happened during 9/11. Bay Area freelance photographer Mickey Pfleger recounts what's happened to him in the year after his surgery following his collision with Chief's tight end Tony Gonzales. We also have The Count making an appearance, as well as Snappy and Mongo. So sit back relax set the VCR to tape "Trading Spaces" adjust the contrast on that computer monitor and enjoy Sports Shooter v43!